A month or two back I brought in an Oliver Ditson drum which cleaned up well. (See the first set of pics below.) Then, a few weeks later a nearly identical drum shows up on ebay only it has a York badge and a Lyon & Healy label!!!! (See the second set of pics below.) The similarities between the two drums are uncanny. It just goes to show how much jobbing / relabeling was going on in the early 1900s when you could buy literally the same instrument from at least three different companies who were clearly sourcing from the same builder - whoever that was! 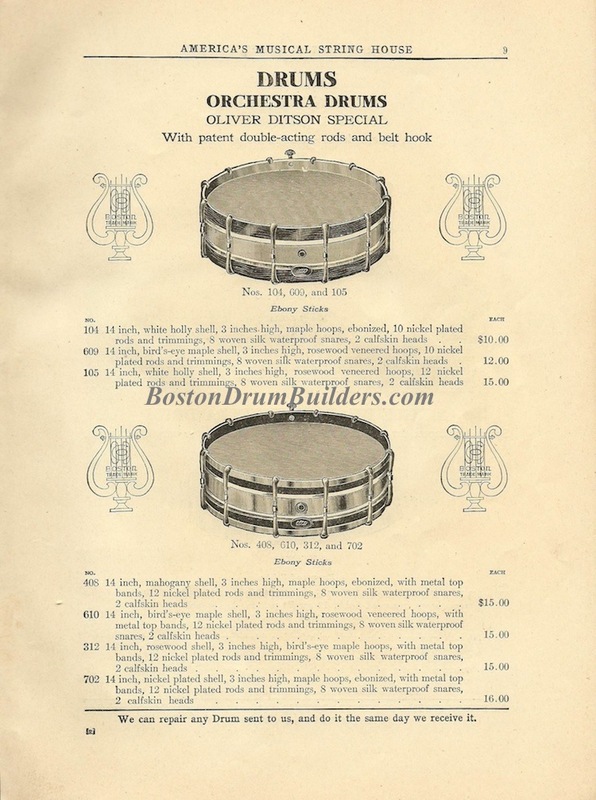 Both drums match up well the 1910 Ditson catalog. (See the third picture below.) 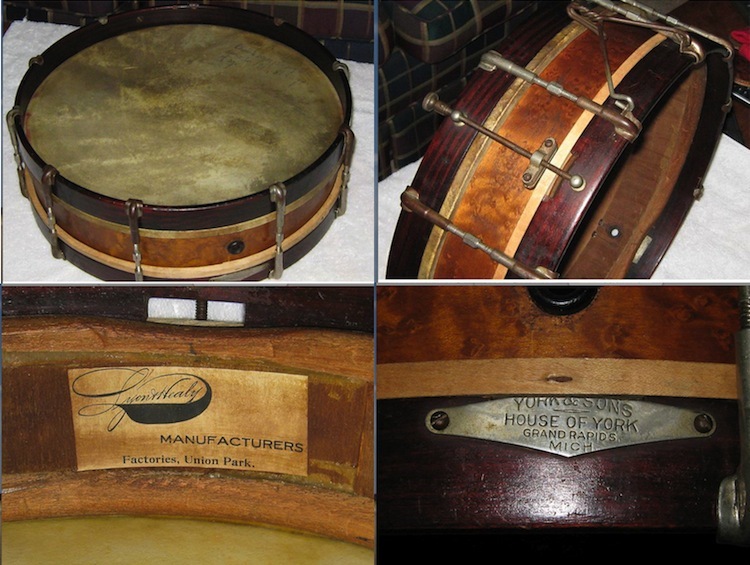 The rosewood veneered hoops on my Ditson are very Haynes-esque so it is possible they were made in house in Boston by Ditson, but otherwise, neither drum strongly resembles those from any of the other Boston builders of the era. My suspicion is that Lyon & Healy may have been responsible for both of these instruments. Ditson had helped to establish P.J. Healy and George W. Lyon in Chicago in 1864 so it's completely possible, if not altogether likely that some sort of working business relationship persisted over the years. 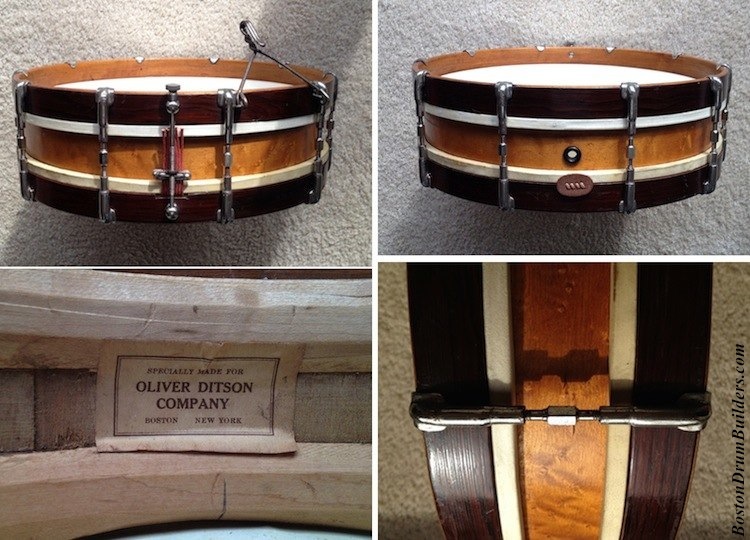 After all, the label in my drum reads "Specially Made for Oliver Ditson Company", not by Oliver Ditson.